Incredibly delicious one-pot Cantonese Style Veg Noodles is a quick n easy recipe that comes together in less than 30 minutes. 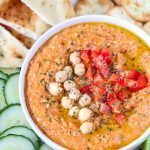 Perfect recipe for a busy weeknight – simple, gluten-free, healthy and full of flavor! On my recent trip to Singapore, I ate Cantonese style veg noodles at a food joint, and the taste still lingers in my mouth. I loved the texture and the different flavors of these noodles where crunchy vegetables meet sweet-tangy sauces and create a lip-smacking dish. Since then, I wanted to experiment and produce the same taste in my kitchen. These noodles are different from the regular Lo mein noodles. 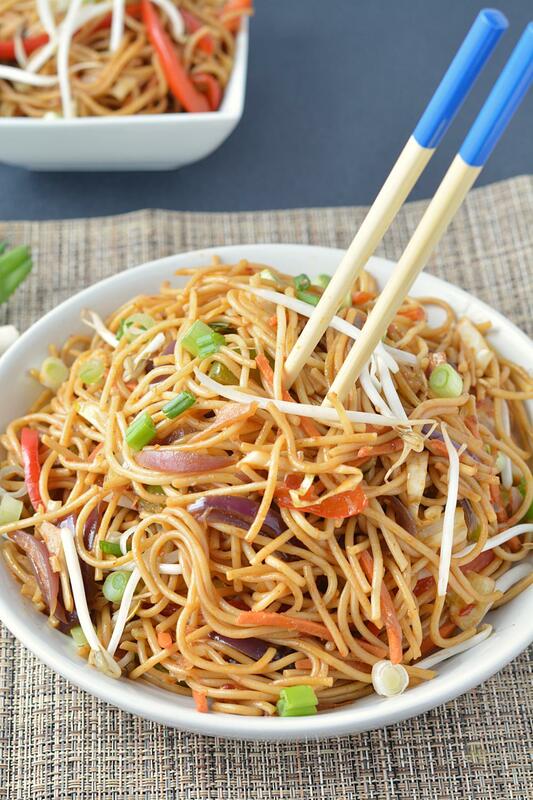 Lo mein noodles are comparatively thicker in size and are simply tossed with sauces, and cooked veggies wherein Cantonese noodles are thinner and are pan-cooked before tossing them with crunchy vegetables and sauces. This recipe is my version of making Cantonese style veg noodles, and I am making no claims of authenticity with this recipe. The original recipe that I ate at the food joint used oyster sauce as the base but to create a veggie version I have substituted oyster sauce with hoisin sauce. Begin by boiling noodles as per package instructions. Cook until noodles is tender and al dente ( firm enough to bite). Drain and set it aside. Heat oil in a pan and add boiled noodles. Keep flipping noodles upside down until crisp and slightly golden brown. They may clump up, but no worries, later when tossed with veggies and sauces they’ll loosen. Remember – before you begin cooking, have everything sliced and ready by your side. This dish comes together quickly, and you may not find enough time in between to cut or chop a vegetable. Store bought pre-chopped coleslaw can be used as a substitute for veggies. Feel free to add some pan cooked tofu pieces to these noodles. Meat lovers can certainly add some cooked meat to add more flavor. Pick vegetables of your choice like bell peppers, carrots, onions, broccoli, red cabbage or green cabbage. Thinly slice them up, cook them in sesame oil and olive oil for few seconds – do not overcook them, vegetables should still have a bite or crunch left to them. Add cooked noodles, spices, sauces and toss until well blended. Taste and adjust seasonings to taste. Top with some bean sprouts, green onions and enjoy a comforting and delicious bowl of wholesome goodness!! If you happen to make this recipe, please leave me your valuable comments below! Incredibly delicious one pot Cantonese Style Veg Noodles is quick and easy recipe that comes together in less than 30 minutes. Perfect recipe for a busy weeknights - simple and full of flavor. Thinly slice or chop veggies. Assemble rest of the ingredients. In a bowl combine all the ingredients listed under sauces and mix until well blended. Set it aside. Boil noodles as per packet instructions. Drain and rinse the cooked noodles in a colander. Heat oil in a pan. Add boiled noodles and cook on medium flame. Keep flipping noodles upside down until crisp and slightly golden brown in color. Set them aside. Heat sesame oil and olive oil in a pan. Add minced garlic. Enjoy it for lunch or for a lite evening snack. The recipe is called “Cantonese Spicy Peanut Noodles.” However, there is no peanut butter in the sauce, and there are no peanuts in the noodles. Is this an error? Marilyn, there is no error. The recipe is called Cantonese Style Veg Noodles and contains no peanuts. Hi Ruchi, Thank You for the recipe. I love noodles and these look soooo good. Thanks for sharing the recipe. Which brand noodles did u use? Or any other brand Tht u can suggest. Sneha, use any brand thin noodles or thin spaghetti. I have used Ronzoni gluten-free thin spaghetti.